Maybe Francis didn't see the interview has been made in Stockholm, where JMJ stated what 'gb' mentionned above aswell. Is their any audio of this concert available ???? I was at this concert with some members of aerozone. The man with a cap "JARRE.CH" was you ? EXCLUSIVE PHOTOS: Jean Michel Jarre, in a final fanfare! 30 years later, Oxygene will still cut the breath of hundreds of thousands of spectators throughout Europe, during a tour "leave". His last concert was held in Zurich, Switzerland, the last leg of a colossal Oxygene concert, a tour which began last December the Marigny theater in Paris after leaving the album anniversary Oxygen 3D reissue with synthesizers d ' time and new arrangements of the original revolutionary album. In Zurich, Jean Michel Jarre was still delighted all generations, at this performance sold out. For the antithesis of "mega-concerts" outside of which he is a specialist and record - the first was Place de la Concorde in 1979, and among others it may be recalled that of Moscow or the Giza plateau - the musical creator french seduced by an intimate atmosphere and minimalist. I am so glad that my unhealthy activity has impressed. 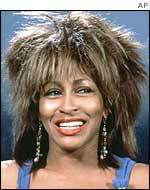 But up-closse that hair is really starting to look like Tina Turner's wig!